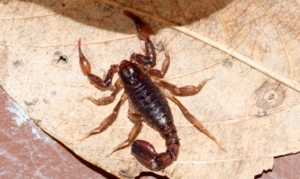 Scorpions are predatory Arachnid of the Scorpione order. Triggering fear and respect, scorpions are in fact difficult to find in this region of the Atlantic rainforest, and here at REGUA, we have only photos of the common yellow scorpion, Tityus serrulatus which are still relatively uncommon. 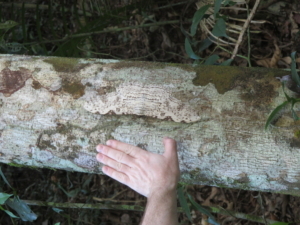 Professor Renner Baptista of the Federal University of Rio de Janeiro was therefore surprised with this latest find. Whilst searching for other Arachnids along with students Hector and Gabriel, they came across an unusual scorpion, their first for REGUA. Found lying under a log at night, this 6cm long little fellow still has to be identified. Promising! We welcomed a new group of students from The Federal University of Rio de Janeiro, who arrived at REGUA this week. They will study spiders on the reserve and will be taught how to sample them. 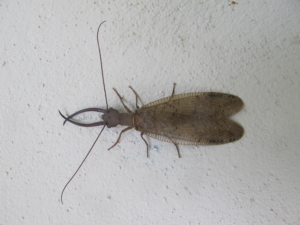 The REGUA list of arachnids was last updated in 2001 by Prof. Adriano Brilhante Kury. It is hoped this latest research will result in many new additions to our list!